Non-US Outlander Fans: To VPN or Not to VPN? Starz is making episode 1 of Outlander, “Sassenach,” available to US residents free for a limited time (Sept. 28th). But what if you’re not a US resident? “One of the great ironies of the Internet is that it is meant to connect everyone together and break down barriers, but at the same time media companies erect location-based barriers around their properties. This practice is known as geo-blocking…To some people however, these constant attempts by the media industry to segregate users according to geographic location seems unfair. 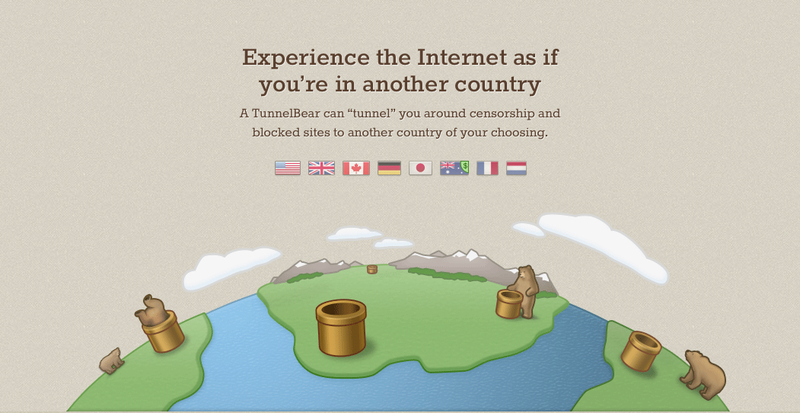 The way around this issue is to use a VPN (which stands for Virtual Private Network) program, such as TunnelBear. Is it really and truly legal? It depends on who you ask, and which respective country’s copyright law is being referenced…do your research. ***Disclaimer: Under no circumstance do I believe in freely sharing paid-for/subscription-based content with those who do not pay for or subscribe to said content (i.e. Napster.com, etc.). That constitutes piracy/theft, robbing the actors/artists/crew/networks of their hard-earned profits, a slap-in-the-face to those who worked so hard to bring the project to fruition. But a VPN does not rob the content-creators of their profit; the way I understand it, it simply gives those who would not otherwise have it, the same access as those who do. It makes the content more widely available. Does this mean that a non-US resident, using a VPN could actually pay for/subscribe to Starz? I don’t believe you can subscribe to Starz as a web-only customer, but honestly I have no idea. Also, I have not personally utilized the above-mentioned (or any for that matter) VPN, nor do I represent them in any way. They are just an example of a VPN that I found reviewed by pcworld.com. I strongly recommend reading the article & doing your own research. In the meantime, the end-goal is still for countries around the world to broadcast Outlander, so I encourage residents in those countries that have not yet picked up the series to continue campaigning—call the networks, email them, Tweet them! Be relentless! Remember, be relentless! Good luck! Thank you! I was able to watch the 1st free episode of Outlander with Tunnelbear. So good! Reblogged this on jennyc10va's Blog. Great write up, Jennifer! Thank you! I have updated the list/deleted BBC Angela, thank you! Thanks for supporting Outlander fans worldwide. There are a few revisions to make in the list of handles. As Angela noted above, UK fans are very much not in favor of the BBC purchasing and extensively editing Outlander. The exciting update is that @HBOnl purchased the Dutch rights and announced it on July 31, nearly at the same time as the New Zealand rights were announced. The handles ending in “nl” can be removed from the list. The 2 remaining handles under “Dutch” are for French-speaking Belgium, which does not have a deal in place. We’ll check with our Scandinavian contacts to see which handles should be targeted there, as new information has come to light. The UK fans are looking to take to Twitter within in the 5 days or so with another campaign. Please watch for announcements as to date, time and hash-tag. Have you watched the first episode of Outlander? If not, here is an amazing post of how you can. for hat reason, and get the most up-to-date news.